The Seattle Center Monorail was built for the 1962 World’s Fair to connect the fairgrounds at Seattle Center with the hotels and restaurants in downtown Seattle. To this day, the monorail continues to carry passengers between these two destinations. The Seattle Center Monorail Platform is located adjacent to the Space Needle and the Experience Music Project. This is also where the administrative offices are located. It is walking distance to many attractions, museums, hotels, theatres, and restaurants. The Westlake Center Monorail Platform is located inside of Westlake Center (5th Avenue and Pine Street) on the third floor of the building. The platform can be accessed through the mall, from the exterior stairwell/elevator on 5th Avenue, and from inside the Downtown Transit Tunnel (by elevator/stairs). Beneath Westlake Center is the downtown Seattle Transit Tunnel, which includes buses and the Sound Transit Link Light Rail which carries passengers between downtown Seattle and Sea-Tac International Airport. If you are using public transportation to travel to Seattle Center or its surrounding hotels, it is very easy to catch a metro bus or the Sound Transit Link Light Rail to Westlake Center Station. From there, you can catch the elevator up to the 3rd floor of the building to ride the Monorail directly to Seattle Center. 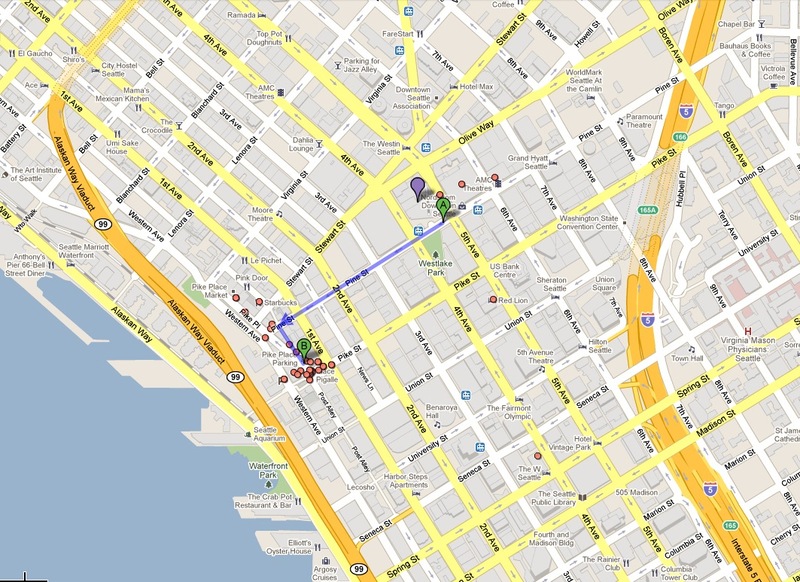 Westlake Center is conveniently located about 5 blocks from the waterfront and Pike Place Market. Pike Place Market is a popular spot to visit in Seattle with fresh produce, flowers, and fish, as well as great restaurants, sights, and sounds! Westlake Center is also only 3 blocks from the Washington State Convention Center. Westlake Center is across the street from Nordstrom’s Flagship Store. Many popular attractions, downtown hotels, restaurants, and shopping centers are within walking distance from the Monorail!